The pressure cooker is ideal for: making soups and stews, searing and stewing meat, and stewing or steaming vegetables, fish and poultry. The WMF pressure cooker cooks at high temperatures and under pressure by applying just one law of physics. Under pressure Wwater first begins to cookboil under pressure at temperatures over 100°C. To reliably build up pressure, the WMF pressure cooker is airtight and firmly locked by means of a bayonet lock and positioning aid. There is a sealing ring in the lid and a locking mechanism in the handle. While the contents of the pot heat up, the integrated automatic heating feature releases air from the pot until the valve audibly closes. The pressure then starts to build up inside the pot and the cooking indicator rises. The Perfect Ultra collection stands out with its optimum user comfort and a design that forever remains timeless. The removable lid handle houses all the functions of the pressure cooker, and a practical all-in-one control knob makes it easy and safe to operate. Safety is also key when steam is being released from the cooker. The automated mechanism makes sure that the steam is released in a controlled manner and that the cooker can only be opened once the pot is completely depressurised. The integrated timer allows you to time your cooking precisely, while the inside scale makes it easier to measure out the ingredients.  WMF has been using the tried and tested Cromargan® stainless steel alloy for cookware, cutlery and kitchen gadgets for nearly 100 years. The material is corrosion-free, acid-resistant and remains shiny for a very long time. Neutral taste and scratch-resistant, the material still looks beautiful and impressive even after being cleaned in the dishwasher. A timer integrated into the cooker lid ensures that the food can be cooked precisely. It displays the minutes for the cooking time, and the timer continues to function even after being removed. The signal is both visual and acoustic, so you can't fail to notice it. The timer is only available on certain models and cooker lids, such as for example on the lid handle in the Perfect Ultra collection. A large cooking indicator displays the two possible cooking settings. The first ring appears when the cooking temperature reaches approx. 110°C, and the second at 119°C. There is a recess on the base that enables you to detect the relevant cooking setting early on. Some models have a yellow ring that displays the residual pressure. The patented TransTherm universal base is made from an aluminium core that is encapsulated in chrome steel. On the one hand, this special construction provides for excellent heat retention and energy-savings when cooking and roasting, while on the other hand the magnetic chrome steel in the base of the pressure cooker makes it suitable for induction hobs too. The base is also extremely stable and does not warp even when the temperature is extremely hot. The technology incorporated in our pressure cookers has been continually developed over the years. There are many new features, although some of the tried and tested features have stood the test of time. Durability and flexibility when using the cooker are extremely important to us at WMF. The proven corrosion-free stainless steel alloy is acid resistant and has a neutral taste. A resistant surface makes sure that your cookware still remains impressive even after many years of use. So that you can use our tried and tested technology on your induction hob, WMF pressure cookers have a TransTherm universal base that is suitable for all hob types. Our series of pressure cookers are made in our in-house production facilities at our Geislingen site and are Made in Germany guaranteed, from the base of the pot to the lid!